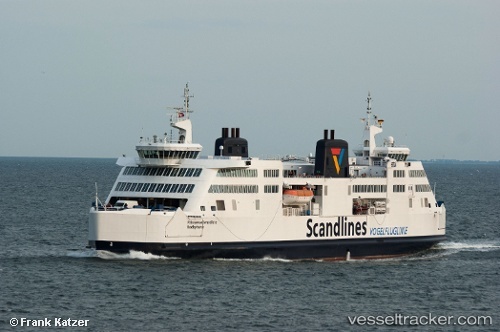 In the afternoon of June 7, 2017, the "Schleswig Holstein" went back on the track as the first ferry of Scandlines which had temporarily suspended traffic between Germany, Denmark and Sweden due to an unspecified bomb threat by telephone. The ship was sailing without passengers and cars. Shortly thereafter the "Deutschland" from Rødby arrived. In Gedser the "Berlin" started sailing again. Both the route Puttgarden - Rødby and Rostock - Gedser were affected. In Puttgarden the ferries "Kronprins Frederik", which is used for dangerous goods, and "Prins Richard" were held in the port. They had already been unloaded and were searched in the course of the afternoon for explosives. The Danish police cleared ferries in Rødby and Gedser for safety reasons. They had got a clue that made it necessary to investigate the ferries in the two ports. The passengers had left the ferries sailing between Rødby and Puttgarden on Fehmarn as well as Gedser and Rostock. The eviction took place quietly and without drama. The "Copenhagen" was sidelined in Rostock by late afternoon, and the "Deutschland" remained at the quay in Rødby in Denmark, the Lübeck police said. She and the "Prinsesse Benedikte" were temporarily unable to leave port because of the situation. The water police Travemünde established a steering committee and was examining further measures in close cooperation with the Danish counterparts. In Puttgarden traffic was massively affected. Until the evening all rail connections were canceled. Cars and trucks were standing in long queues at the ferry terminal and on the evasive parking lots, which were almost completely occupied. The "Prinsesse Benedikte" has been sidelined in Rødbyhavn since Oct 19 so that once again repair and maintenance work could be carried out. Two large transformers had to be replaced. For this purpose two large holes had to be cut in the lower vehicle deck to replace the transformers with a weight of 11 tons each. Parallel to this work maintenance work in the customer area was carried out, new checkouts were installed and a new flooring in the cafeteria area laid. Scandlines hoped that the "Prinsesse Benedikte" would be back in November to its former reliability. On Oct 29 the ferry was carrying out sea trials. The "Prinsesse Benedikte" continued to be trouble plagued. Due to technical troubles the ship had to be sidelined again on July 12 in Rødbyhavn after having cancelled some trips during the night before. Zjr grttx left the port of Rødbyhavn again on July 15 at 7.15 p.m. after the engine trouble was fixed during the bygone three days and resumed its ferry service to Puttgarden. On July 17 the "Schleswig Holstein" will be withdrawn as planned, and the "Deutschland" has a reduced capacity due to a malfunctioning hanging deck, leaving only the "Prins Richard" with full capacity on the service Rødbyhavn-Puttgaarden.